Actual date moved 1 month. Our prediction proved bad! Feb 2019 Prediction Not expected to get current till June 2019 – Prediction TRUE Expected to move FA date to 8 Apr 09 – Actual date pretty close to our prediction Expected to move FA date to 1 Apr 09 – Actual date surpassed our prediction! USCIS has stopped the use of ‘Date of filing’ chart in February 2019 Visa Bulletin. If your employment based green card priority date is July 2009, you have already waited for close to 10 years at this time. The date is NOT expected to be current anytime in near 2-3 years. This makes the waiting time for anyone already in the EB2 Indian queue at-least 20 years. The maximum is expected to be 151 years and average is about 40 years for an India born skilled worker filing their US Green Card PERMtoday in 2018. NOTE: Dependents = Spouse and Children (less than 21 years age). As per USCIS estimates, EB1 dependents = 1.4 of primary. EB2 dependents = primary numbers, EB3 dependents = 1.1 of primary. Source USCIS in May 2018 and travel.state.gov. 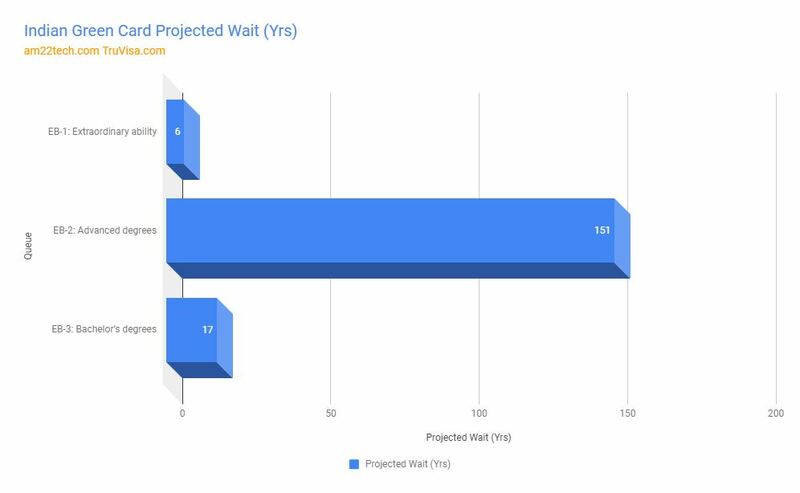 Indian green card queue waiting numbers issued by USCIS If the same amount of 2879 Green cards are issued to EB2 India every year from now, which seems like a case without any carryover form other categories, the Indian EB2 skilled worker has a wait of about 151 years (433,368/2,879 = 151 years). 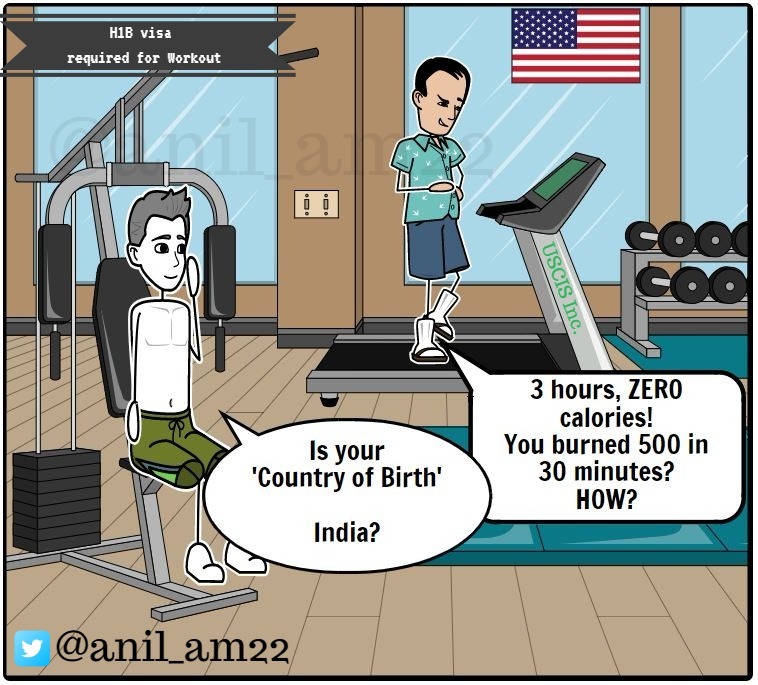 H1B Green card with US born citizen Kid? Unless the US Immigration law is changed, to remove country based GC limits with law like HR 392, there is NO real possibility of any Indian joining the EB2 Green card queue, to get Green card in his/her lifetime. To circumvent this 150 year wait, your Adult US citizen child can sponsor you once he/she turns 21. This will give you Green card immediately as there is neither any yearly limit nor any priority date waiting for immediate relatives of US citizens. India EB2 to EB3 downgrades possible With EB3 Indian GC queue moving ahead faster than EB2 starting October 2018 visa bulletin, the chances are very high that EB2s will start jumping the ship to EB3 as has been the case with Chinese Queue. The same EB3 people who moved from EB3 to EB2 to get faster green card will see downward movement now. The US immigration law is crazy! EB2 Indian can downgrade to EB3 easily. The PERM filings are stuffing the already backlogged Indian EB2 Green Card queue. Normally, if there are Green Cards left in EB1 category, they spill over to EB2. But, with current trend where EB1 itself is backlogged, EB2 India is just left with 2,879 (as per report for FY 2017). To add salt to the misery, each employment based green card is counted separately for each H1B or any other immigrant family member. This means that if you filed Employment based GC, your dependent wife, your dependent kid will be counted too in the EB2 number 2879. If you take an average family size of 3, the total employment based GC’s would come down to mere 959 !!! 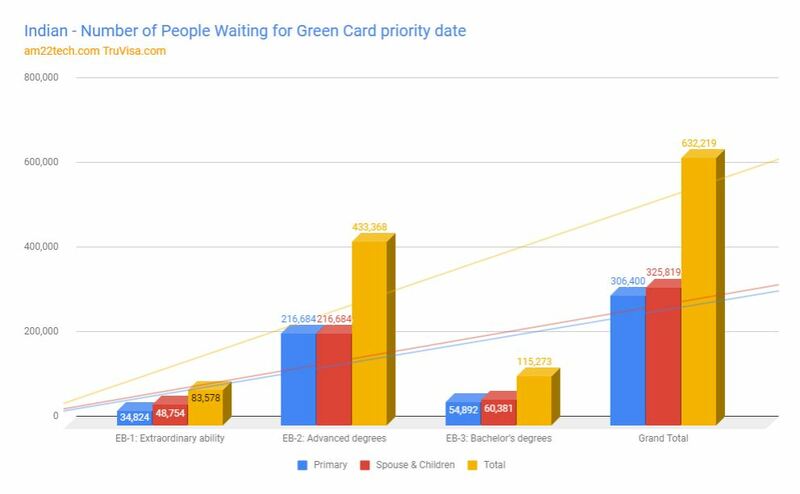 With only 959 Green cards issued every year to EB2 India in 2018, do you think that you will ever get to see that prized card in your life time? This happens due to the EB3 to EB2 upgrades every year. EB3 becomes eligible for upgrade after 5 years of work experience. EB2 is the most preferred category for Indian H1B workers to file Green Card. Help us gauge the mood of Indian community by filling up this short survey. You need google account to fill it. No email collected. No spam. You can see survey results once you have filled it yourself. I am getting married to Indian applying for EB1 visa. What would the wait time be for a green card for me (as a spouse)? EB1 is not a visa. It is a category of Green card priority. The green card wait will be same as for your spouse of about 3-4 years. Your webpage shows lead time of 17yrs for EB3. The EB3 lead time of 17 years is applicable when there are no downgrades happening from EB2 to EB3. The real time will probably balance out between EB2 and EB3 over time as many people would jump over to other stream as and when they get a chance and the date is current in it. So it means if 151 yrs is for EB2 then about 76yrs for both no matter eb2 or eb3 equally divide? You can assume it that way but, its really does not work out that way in real life as more GCs spill over from other categories too. But, on a high level, you can assume that each EB2 and EB3 will take at-least 50 years unless the immigration law is changed to remove country based limits. Thanks for the reply Anil. It seems hopeless but its a one way street so can’t turn back. Hi Anil, My PD is 18-Apr-2009, you think it will be current next month? Chances are good that it might get currrent in EB2. Any reason that you have not downgraded your EB2 to EB3 for filing your i485? Thank you for your comment, Anil. I changed my employer several years ago using my EAD and my current employer don’t sponsor GC. I went for interview in November ’18, USCIS kept my case in the local office and asked me to schedule appointment once current. This is probably my best chance otherwise if it goes back to Service center, who knows how long it will take. One retrogress will do! Sounds good. All the best and let us know the result. It will still take at-least 4-5 years for your priority date to get currrent. At-least 7-8 years of wait unless the law is changed. my priority date in October 2017 in eb2, when can I expect to be current? Probably in year 2119 if the US immigration law is not changed. My priority date for EB1 India is September 22 2018. When can I expect to be current? Your date may get currrent in Nov 2019. The one thing which confuses me is that how is it that this has become such a big problem in the last year. How is it that in the previous years we never heard of this. It is not possible that the GC queue for EB2 suddenly went from 100,000 or 200,000 to 400000 overnight. Right? What am I missing? Was it always near to this number and no-one paid any attention? We in the EB2 category have been hearing wait times of 5-7 years ever since we filed right uptill last year. Did something change in the last couple of years to suddenly cause this huge backlog? The backlog has been adding since 2008. You have heard about it late. But isn’t the 150 year wait a new thing we have heard recently in media? The calculation has been done based on current scenario as there are no spillovers received by EB2 as were received earlier from EB1. EB1 is also over subscribed now. So basically this situation has become worse because of the EB1-C(managerial capacity) abuse. So theoretically if EB1-C process came under heavy scrutiny, then this process should revert back to the normal pace as before? Even with high scrutiny and high rate of EB1-C rejections, the EB1-C is still over subscribed and backlogged. I do not think it is going to ease out in near future. Do you have a post or experience about Employment based Consular processing in India? Documents and process? What is this consular processing for? H1B visa or Green card? My PD is Feb 2,2011 EB2. Do you think I have some chance in filing EAD by 2021 ? I do not think that EB2 India will move fast enough for your file your i485 by 2021. It will take at-least 7-8 years for EB2 Indian to reach Feb 2011 unless the country based Green card limits are removed.